On Wednesday, October 24th, the NLG-Mass Chapter threw its 10th Annual Fall Sustainer Party. 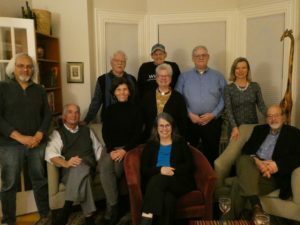 In celebration of our wonderful Sustainers who generously support the work of NLG-Mass, NLG-Mass Chapter organized an annual cocktail party at NLG Attorney Judy Somberg’s beautiful house in Cambridge, with Middle Eastern food and great company. Contributions made by our Sustainers help our Chapter in multiple facets: they enable our Litigation Committee to file civil lawsuits against injustices committed by large institutions, they aid our Street Law Clinics in which NLG members provide Know Your Rights trainings, and they help our Mass Defense Committee with trainings for Legal Observers and counseling for direct action. We, the NLG-Mass Chapter, are incredibly appreciative for our Sustainers and everything they do to support the Chapter. Thank you, and cheers! If you are interested in joining the NLG-Mass Chapter as either a member or sustainer, please visit our Join website. You can also contact Urszula Masny-Latos, Executive Director, with any questions regarding the process at nlgmass-director@igc.org.